Posted 3/8/2018 12:05pm by Cherry Valley Organics. Do you know who grows the food you eat? If you shop at a big grocery chain, the face behind that cucumber in your salad is a complete mystery. But, if you support a small, local farm like Cherry Valley Organics, there's no mystery as to whose hands (and heart!) grew the food you put into your body. Today, we'd like to tell you more about Tim Gebhart, our Crop Manager for Produce, Fruit, and Mushrooms here at Cherry Valley Organics. 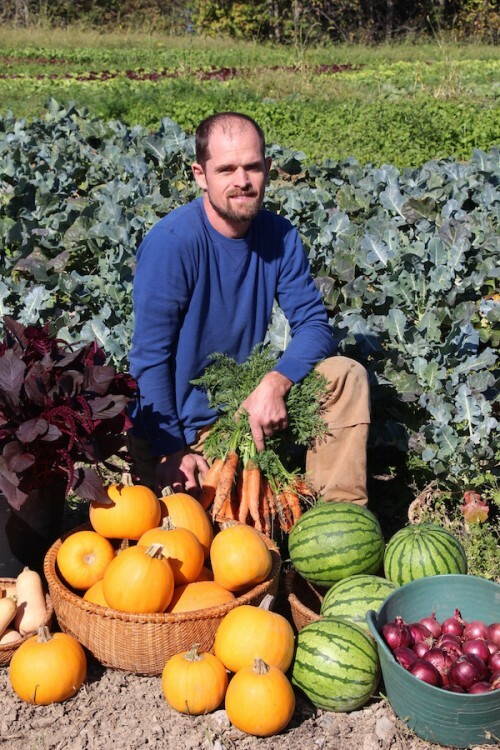 Tim's passion and prowess for organic farming runs deep, and as you're about to learn, Tim is incredibly proud to know he's supplying hundreds of Pittsbugh-area families with healthy, nutrient dense, organic fruits and vegetables. If you want Tim to grow food for your family, too, sign up for our 2018 CSA Farm Share program here for just $25.00 per week. Childhood Roots: Plants have always been a part of Tim's life. Growing up in western Pennsylvania, Tim worked for his father's landscaping company through high school and college. At their family home, they also tended acres of ornamental plants, a big vegetable garden, chickens, pigs, and cows. One of Tim's proudest childhood moments was when his busy dad put him in charge of planting and tending the family's vegetable garden for an entire growing season. "I was about 13 years old, and he basically handed me the reins on everything. He gave me full responsibility and trusted me to do my thing. I did it, and it was 'my garden' for that year and I was really proud of that," Tim recalls. College Days: Tim went on to earn a B.S. in horticulture at Penn State University, with a focus on growing ornamentals. He planned to build his career around the ornamental aspects of plants; it wasn't until after he graduated that Tim discovered his love of plants extended far beyond their beauty. One of our favorite stories from Tim involves how he came to realize that growing organic food was his true calling. After college, Tim was working full-time as a campus minister and volunteering one day a week at an education center for sustainable gardening. "I quickly realized that that one day was the high point of my week. I loved it. When they said I could stop coming in the winter, I was so disappointed! They had livestock and a garden there, and it made me realize that I wanted my life to be about growing food. 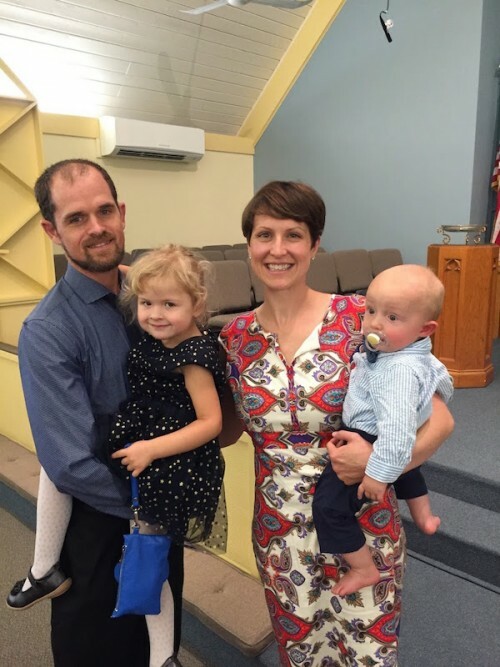 When we relocated and my wife started going to graduate school, I could have transferred to become a campus minister at another school, but I made the decision to switch to organic agriculture instead, and I have not regretted that choice for a single moment." Before Cherry Valley Organics: Before Tim joined us here at Cherry Valley, he worked at Shenot's Orchard in Wexford, PA as a farmhand. He spent his days planting, weeding, and harvesting vegetables and apples. Tim learned a lot from the growing system they use at Shenot's. "They have a great system there, and they really know how to step back and let the process happen. I learned how growing food on a large scale works, and how important it is to focus on growing a few things really well. But I also saw how maybe I would change a few things up, too. I also became more interested in organic agriculture instead of conventional, and that led me to my next job at Kretchmann's." 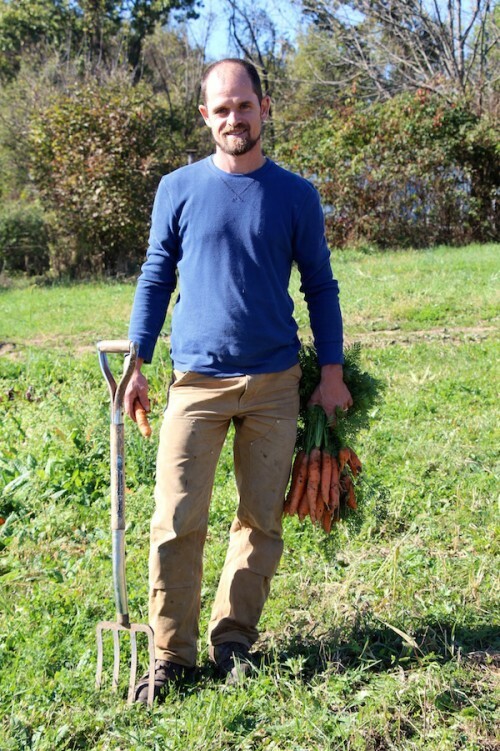 For the following five years, Tim worked at the Kretchmann Family Organic Farm near Zelienople, PA, where he continued to learn more about organic farming techniques. Joining the Cherry Valley Organics Family: Tim joined our farm family in early 2017 as our head grower. 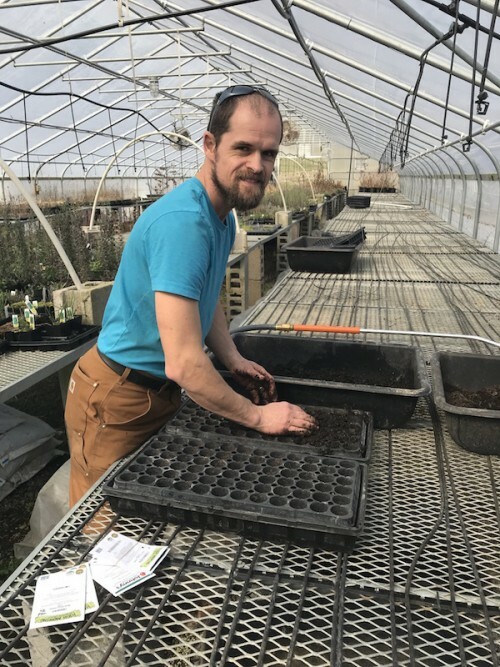 At Cherry Valley, Tim's focus is on building our soil through the addition of high-quality composts and cultivating robust plants without relying on chemical fertilizers and pesticides (even organic ones). "Farming, to me, is like a puzzle," he says. "It's multifaceted and a never-ending challenge. You know what you want to do, and you have to figure out the best way to do it. An organic farmer has to understand how everything is connected and how what you do this year affects what happens next year. It's a balancing act that involves timing and adapting and a whole lot of learning. You can get instructions on how to grow something, but it isn't a cut and dry science because there are so many variables. Sometimes it can be infuriating, but that also keeps it real and makes it interesting!" Tim's Thoughts on Being a Farmer: "I love making people healthier through the foods that they eat. When I switched from ministry to farming, I was looking for a common thread between them both. Farming is still tending to people in a way, both spiritually and physically. The two are interconnected, really. On hard days, when I'm out in the field, it's a good thing for me to remember. Ultimately, the food we grow here at the farm is making a difference in the lives of our customers. You don't have to study a label or write to a manufacturer to find out about what's inside a package of food. We can tell you everything that went into growing the fruits and vegetables we sell to our customers, and that means a lot." Tim's Family: In addition to being a farmer, Tim is also a husband and a dad. His young children, Charlotte and Jacob, keep him busy at home, too. A diagnosis of Crohn's disease a few years ago acts as further motivation for Tim to embrace his organic principals. "I've been able to control my Crohn's primarily through diet, and it's allowed me to live pain-free without medication. I really believe that both people and plants thrive when well-nourished. Each and every time I hear positive feedback from a customer, it makes me proud to be an organic farmer." We hope you enjoyed this little glimpse into Farmer Tim's background and motivations. And, if you want to enjoy the fruits of his efforts here at the farm, hop onboard our CSA Farm Share program for the coming season. Sign ups are now open and we'd love to feed you and your family, too!